There are a lot of terrible problems that North Carolinians have been forced to endure as a result of the Medicaid Blockade that state legislators continue to enforce. Here’s another especially awful one: Every year, an average of 14,776 North Carolina families experience financial distress as the result of catastrophic medical bills. This is the case even though 67 percent of families lacking health coverage have either a full-time or part-time worker in the family. Happily, in spite of the Blockade, the Affordable Care Act has helped millions of people. Prior to passage of the ACA, 41 percent of adults between ages 19 and 64 years reported having trouble paying medical bills and/or accumulated medical debt. As the ACA has increased Americans’ ability to access more affordable health coverage, however, the number of people reporting difficulty paying their bills fell by 13 million people in the past five years. Unfortunately, the Blockade has prevented these benefits from flowing to hundreds of thousands of other people who need them. Not surprisingly, there is a strong association between medical debt and lack of health care coverage. 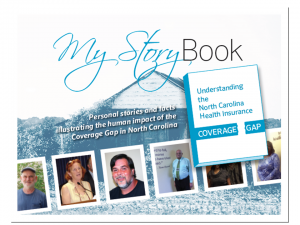 And, of course, thanks to the Medicaid Blockade, there are 500,000 North Carolinians in the coverage gap and thus at risk of facing catastrophic medical bills. What’s more, many of these insurmountable medical bills result from one-time events. Take, for example, Jacqueline and Darian. Five years ago, Darian experienced a workplace injury that has left him unable to return to the labor force. Even though Jacqueline still works, she does not have employer-sponsored health insurance. Unfortunately, both are in the coverage gap. Darian’s workplace injury resulted in a medical bill of close to $20,000. That is a lot of money for most families and completely beyond the means of low-income working families. Luckily, Darian was among a relatively small group of people who are able to obtain charity care. But, while Jacqueline and Darian appreciate the charity care they received, they understand that their fiscal, physical, and emotional health are still at risk in the event of another accident, unforeseen injury or health emergency. What’s more, both also recognize that they are not alone in their financial fragility; they understand that medical debt and its many related impacts are a huge community-wide plague. The bottom line: People like Jacqueline and Darian understand only too well that even hard working North Carolinians can lose their ability to work and contribute financially to their communities if they lack access to health care and remain uninsured. And thanks to the Medicaid Blockade, this is a huge problem that’s not going away any time soon.